Please note when selecting option "send insects on specific date" this is the date the caterpillars are dispatched, not the delivery date. “Send insects on Specific Date” is usually the best choice. You’ll save valuable time and you will receive everything you need in one convenient, exciting package. “Send with Redeemable Certificate” is a good option only if you are not sure when you will be ready to receive and raise your insects. This option may include an additional cost for shipping and handling the insects later. Please see product description to check if this appplies to the kit you are purchasing. 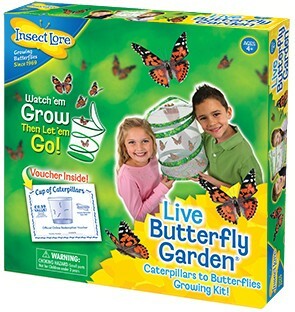 Give every child the Gift of Metamorphosis with the Live Butterfly Garden! 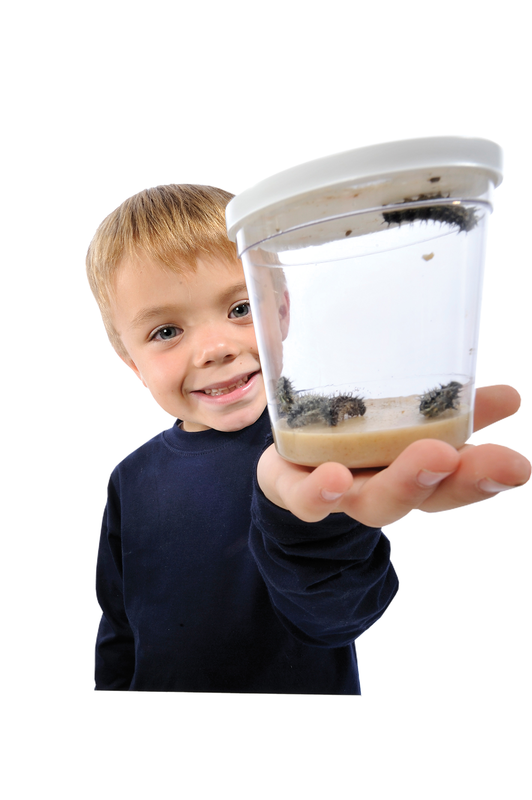 Choose to receive the kit either with a voucher or with live caterpillars immediately (by selecting a send out date). 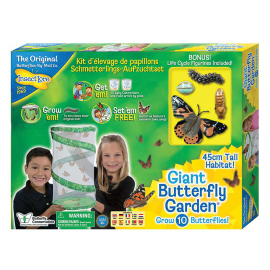 This educational kit gives children, students and families an unforgettable opportunity to watch caterpillars change into chrysalides and then emerge as beautiful Painted Lady Butterflies. 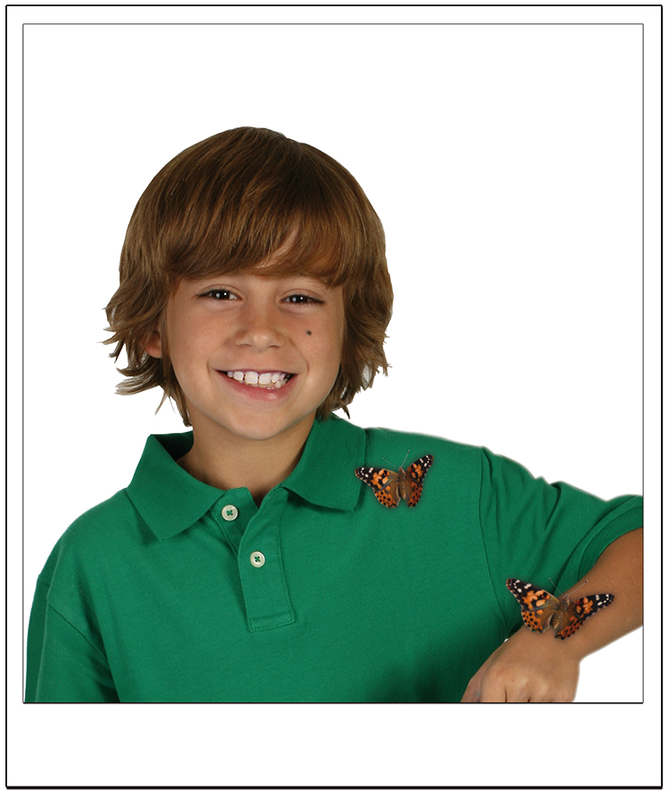 Raise and feed your very own butterflies and then release them into the wild! The entire transformation from caterpillar to adult butterfly takes about three to five weeks. 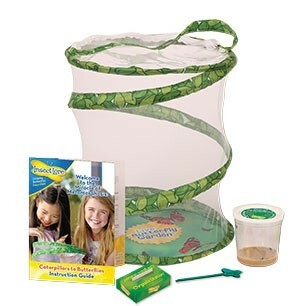 3-5 caterpillars (a live butterfly culture) will arrive in a clear plastic cup with all of the nutritious food they need. Place the cup in a safe place away from direct sunlight. 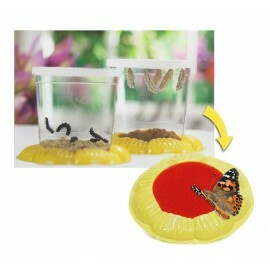 The caterpillars will remain in the cup and will eat, spin silk and grow to TEN times their original size! After seven to ten days they will hang upside down and harden into chrysalides (chrysalides are also known as pupae). The Butterfly Garden Habitat is a reusable, cylindrical mesh container perfect for up close butterfly viewing! When not in use it folds flat for easy storage. Once the chrysalides have hardened, gently move them to the pop-up butterfly habitat. It will take about seven to ten more days for them to complete the transformation to adult butterflies. 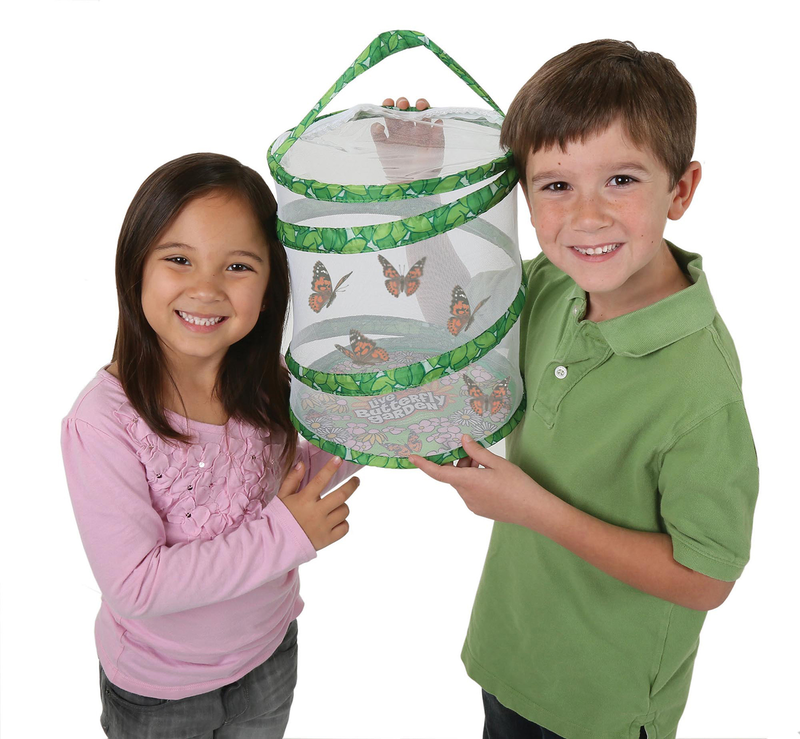 •Pop-up, reusable 30cm tall mesh habitat perfect for butterfly viewing! Great fun, simple to do. Just make sure you keep an eye out for the emerging butterflies...can happen quicker than you think. Excellent value for money. Loved releasing them into the garden. So easy to use and very fascinating to watch the changes take place. All five of ours hatched and our children and the children that we look after have been so interested watching and helping. We have to let our remaining three go soon and we will miss having them around. Will be ordering again. Great product. 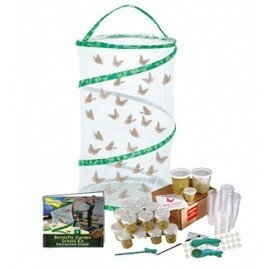 Bought this kit for my 5 yr old son, he's a massive bug & insect lover. And I have to admit I enjoyed it as much as he did! All 5 tiny caterpillars grew huge day by day, made their chrysalis and turned into butterflies. It was amazing to watch. We kept them fora few days feefeeding them fruit and nectar then set them free. Would recommend it to anyone and willdef bbe doing it again next year! I ordered this to be delivered on 6th March 2015. It arrived just in time for my daughters birthday. She was over the moon with this gift. I have to say I have been engrossed everyday to see if the tiny caterpillars had grown. Today 31st March 2015, we have 5 beautiful butterflies, 1 very happy little girl and an amazed mummy. What an incredible process to watch. We will be releasing them in a couple of days. I would highly recommend Insect Lore. I have to say I was a bit nervous about what state the caterpillars would be in when they arrived, but they came securely packed in a box with instructions and all the kit needed. Well done Insect Lore. 5+ stars!!! A brilliant set. The kids absolutely loved watching them change from small caterpillars through to butterfly's that they were able to release. We will be purchasing refills for years to come. I purchased this product for my class several years ago I use it every year and it is still in a good condition. Each year I order more caterpillars using the voucher system. It is a marvellous educational product which the children love. There are also other products to enhance learning available from this company. 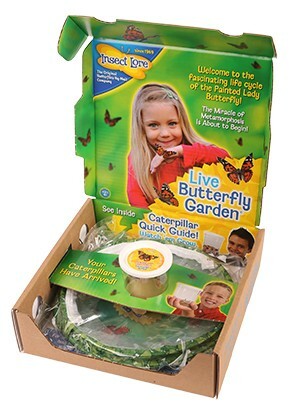 I ordered this kit with some scepticism as to whether or not it would actually work - I received 5 tiny caterpillars in the post and 3 weeks later have just released 5 beautiful butterflies! Both my son and I have thoroughly enjoyed watching the stages and then being able to release them by hand was the icing on the cake! My son has autism and it's been a real test of patience for him, but I'm so glad I ordered them and persevered as it was such an educational experience for us both!! Highly recommended! Can't wait for our next kit! !